I wonder why being described as a “painter” can so often be aggravating? I recognize it as an accurate description of my concerns as an artist, the methods and materials used to externalize these concerns, as well as the histories and discourses that frame them. 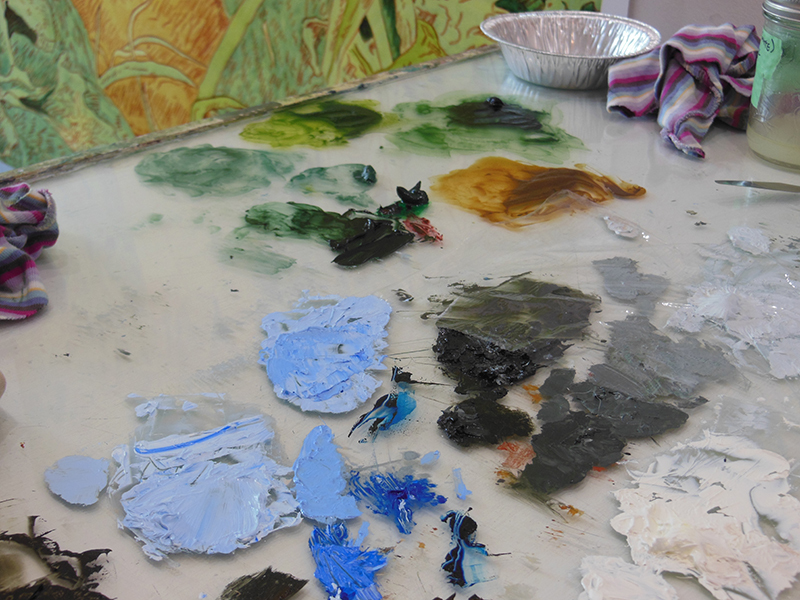 I spend a disproportionate amount of my time painting, or thinking about painting, or teaching painting. And yet, in certain contexts, the term feels condescending. For many people in the art world, “painter” is a label that attaches as a kind anachronism, a throwback to a pre-“post-studio” era. It is also, therefore, a mark of being not quite bright enough to understand that what you are doing is no longer relevant. In general, I describe myself as an artist. But the truth is, without painting and drawing I wouldn’t be an artist. I don’t make my work in order to be an artist, rather, I am an artist because of my work. This may seem like a nebulous distinction, but it has implications for the ways I think about what I do in the studio. Even when what I’m making isn’t painting as such, I’m thinking about it in relationship to painting. My sensibility is pictorial, and image-making is the basis for my responses to the world. The labour of applying paint to a support, the patient building of mark upon mark, layer upon layer, decision after decision, is also a mode of thinking. My work isn’t “conceptual” in the way that this word is often used in relation to artworks – that is, as a diagram of thinking that is conveniently available to the initiated viewer – but, it is informed by all sorts of ideas and experiences that are external to art. These ideas are filtered through the process of making, often in ways that are obscure to me, and they govern or shift the choices I make in the work. Crucially, the reverse is also true: making my work illuminates and informs my life. For me, drawing and painting are the ways that light is cast on the world, they allow a kind of search that I don’t find possible in other forms. The focused combination of physical, emotional, and rational energies that are brought to bear when I am painting clarifies how I relate to the world, and ideally, how I am living my life. Finally, there are the objects themselves, their specific amalgam of spirit and dirt. When I’m standing in front of a great painting or drawing, the sense of vitality, experience, and hope that has been conjured out of inanimate mud seems as close to a miracle as I am likely to encounter. When I ask myself why I am a “painter”, these qualities are my answers. And, when asked why I “still” make paintings, I try to keep these things in mind, and then answer “because I don’t know any better”. Chris, I believe we are all asked this question in relation to whatever it is that we “do”. Society defines itself by what it does individually and collectively. We are limited by this definition, because we are so very much more than what we do. I wish we’d stop doing this! When I write I often refer to myself as a creative…don’t really feel so comfortable with this, artist and or painter is what I’m relatively most comfortable with. Language can be very restrictive. I wish sometimes we could just go back to making undefined noises grunts and snorts, then maybe we wouldn’t have to concern ourselves with what it is we do so much. That’s true, Catherine; in some contexts (crossing the US border, for example) I don’t even admit to being an artist – in that case I’m a “professor”. It’s the baggage that our terms bring along with them that both make them meaningful, and impose restrictive limits. On the other hand, language is still holds the possibility of clear and precise communication. Chris: This is so right on. The last paragraph about “amalgam of spirit and dirt” resonated deeply as I excavate my thinking and written reflections on why I paint. Have you read the 2012 speech Marlene Dumas gave when she she received the Vermeer Prize in Holland. I think you would find good company there. 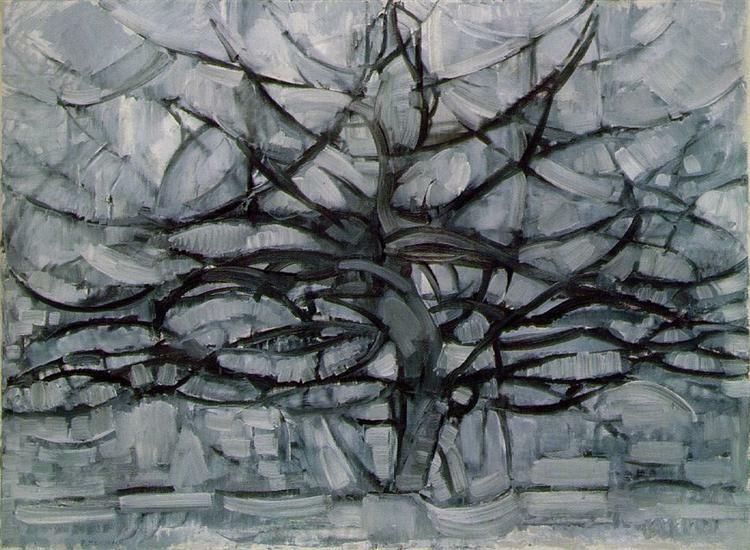 Thanks for the image of Mondrian “THe Grey Tree”. Thanks Irene. This post began as a journal rant that I wrote after a particularly insulting studio visit with a curator. It was obvious that this person was certain that painting was a thing of the past unless it also had some razamataz in the form of video projections or other “contemporary media” added in. But in the end, it became an affirmation of why it is that I make my work. Ironically, if I didn’t make paintings, I wouldn’t ever encounter people who think painting is passé. Thank you so for your comments Liz, it is nice to know that these writings do sometimes resonate with other artists.